Every serious hand-loader should have at least one high-quality set of calipers — a serious tool that can reliably (and repeatably) measure to .001″ (and preferably, .0005″). Quality calipers made by Starrett, Mitutoyo (and other good manufacturers) aren’t cheap, but they will work well for decades. In addition to the quality calipers you keep at home, every shooter have a “range kit” caliper set. This can be used to quickly measure Cartridge OAL, check base-to-ogive lengths of loaded ammo (with a comparator placed on the jaws), measure group size, and perform a myriad of other tasks at the range. You don’t want to spend a fortune on your range calipers — in the event that they are inadvertently left behind (or loaned to a fellow shooter and never returned). 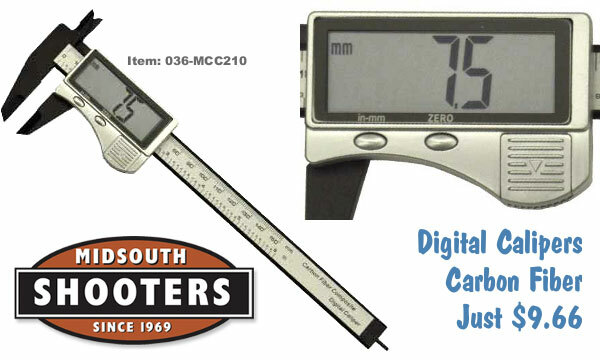 Right now, Midsouth Shooters Supply is selling Electronic Digital Calipers for under $10.00 that fill the “range kit” role very nicely. Constructed with carbon fiber components, these Altraco calipers are light-weight and rust-resistant. Measurements are displayed in large, easy-to-read, high contrast numbers. And with the flick of a button you can switch between English (inch) and Metric (mm) read-outs. For $9.66 these are a bargain “back-up” set of calipers to be kept in a glove compartment or range kit. No they will not replace your Mitutoyo calipers, but you won’t cry if they get lost! Share the post "Range Kit Carbon Calipers for under $10.00 at Midsouth"